It felt as if something was missing from our ornamental pond, and after ‘pond-ering’ for a while, I decided that a water feature was needed to make it complete. A fountain, to be precise! I wanted one to add an additional aspect to the pond, to provide light-filled, moving water as well as static. I always love to see fountains when I visit other gardens, and appreciate the way they create an interesting vertical dimension. 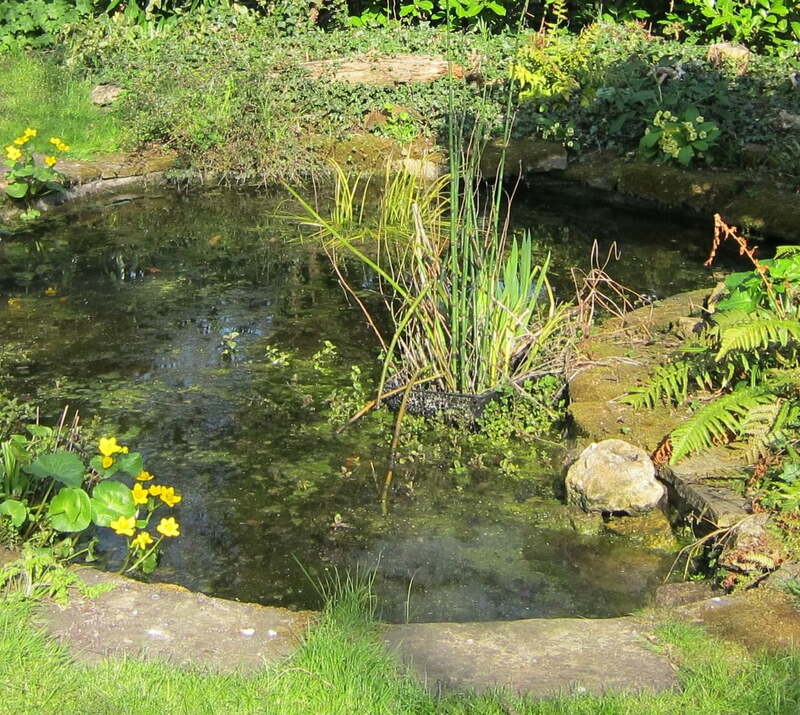 Now, our ornamental pond is way down the garden, beyond the reach of a feasible electric cable. It is roughly kidney shaped, and is a maximum of 3 metres long by 2 metres wide. It is about 90 cm deep in the centre, and shelves quite steeply, although much of it is very shallow. It is edged with old pieces of limestone which, miraculously, just happened to be in the garden when we bought the house. Some of the pieces are actually parts of gravestones and bear tantalising fragments of inscriptions. It contains both marginals and aquatic plants, and in summer a water lily reigns supreme. The area around the pond is planted mainly with ferns and there are also pieces of architectural interest – a Victorian, terracotta ball and a large brass sphere. There is a poolside holly ‘Golden King,’ pruned and trained into a formal shape, which does cast a certain amount of shadow over the pond, so I hope a solar powered pump will be able to cope with that. 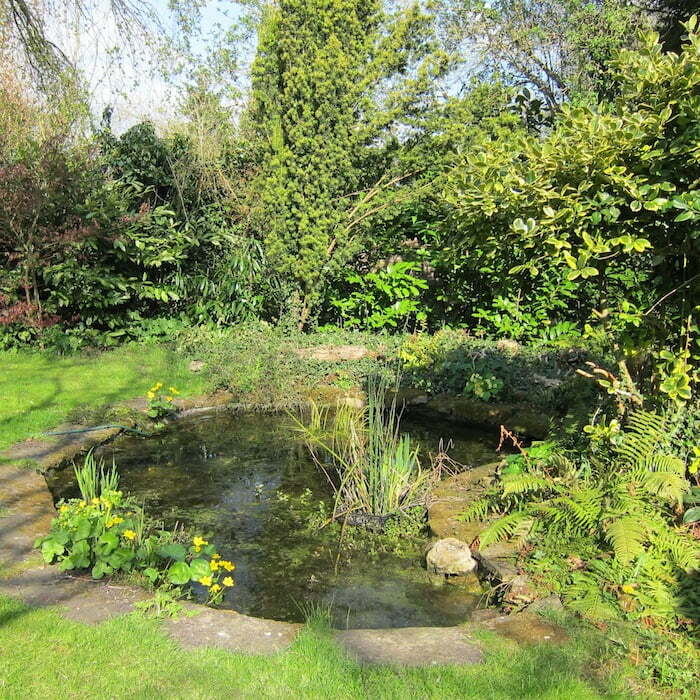 The pond contains about half a dozen goldfish, some of which are well grown. They have a lot of space to enjoy, which they have to share at certain times of the year with clusters of writhing frogs, and newts. In Spring there is a cacophony of noise from over – enthusiastic frogs searching for a mate, and the shallow water boils with them. In the freezing temperatures of 2010 there were, sadly, many frogs which did not survive, and they were frozen in the thick ice for a long time before the thaw. Happily, numbers were quickly increased by prodigious numbers of tadpoles the following March. The newts are more timid and lurk quietly in the weeds, before disappearing just as mysteriously when the eggs are laid. Weeks later tiny little newtlets, with delicate feathery gills, begin to explore the shallow margins of the pond. In the end, I chose a solar pump from Swell UK , which carries very positive endorsements on its site. Delivery was speedy and I was given support to choose the correct pump for the job. I was initially surprised by how small it is – I don’t know what I was expecting, something the size of a small van I think. Aesthetically it is quite pleasing as it is neat and looks quite contemporary. 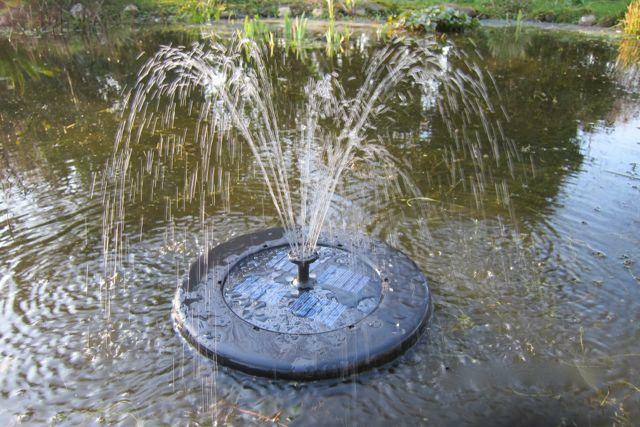 It is a round, matt black unit, about the size of a dinner plate, which will merge well into the pond. The claim is that it works reliably in rain, gloom … and even in the dark! The instructions advise that the unit is left in the sun for a day before use, and luckily we had a couple of days of glorious weather, so sunshine was not in short supply, as it can be so often at this time of year. I followed the instructions to the letter, but when it came to turning on the unit … nothing happened. Now this turned out to be a two-pronged human error, rather than an error with the unit. Dare I admit my first mistake … oh, go on then ! 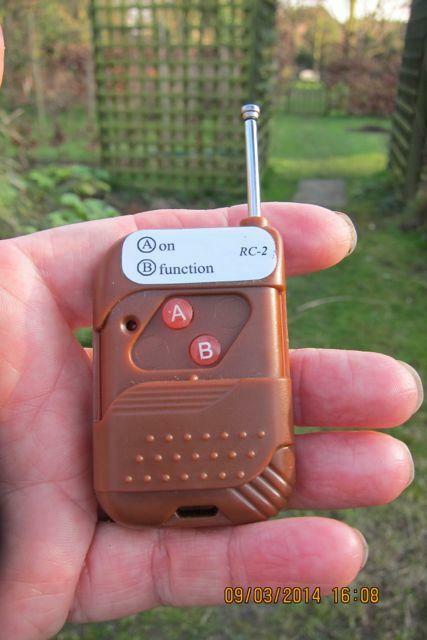 Now there is an extremely cute little remote control unit, with two buttons, button ‘A’ to turn the fountain on and off, and button ‘B’ to change the fountain’s function. In the photo, you can see that I have discovered the little cover on the casing, which slides up and down to reveal the buttons. Erm, what you don’t see is me pressing the graphic of button ‘A’ on the little silver strip, at the top of the remote control unit, and then being surprised when nothing happened! The second human error took a little longer to diagnose. I knew the remote was working, because a red light came on when a button was pressed, but nothing else happened at all. I checked and rechecked the instructions and knew I had followed them to the letter, so was it faulty ? No, the unit was fine, human error had failed to connect a cable correctly ! 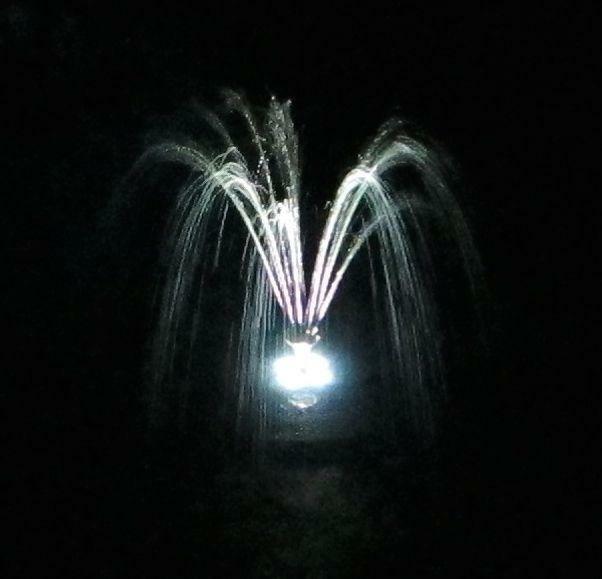 As soon as that was rectified, the fountain burst into life and looked really good. Now, I think you have to be realistic about this, as it is not the Chatsworth ‘Emperor Fountain,’ or the fountains at Versailles, but it does exactly what Swell UK says it will do. It is a gentle fountain of about 40 cm, making an attractive display, and a pleasing noise, suitable for a smallish ornamental pond. As the sun was shining behind it, there was even a little rainbow thing going on! The little remote gives delusions of great power, as you can play endlessly with the different functions of the fountain, and there are five pre-set programmes to choose from. 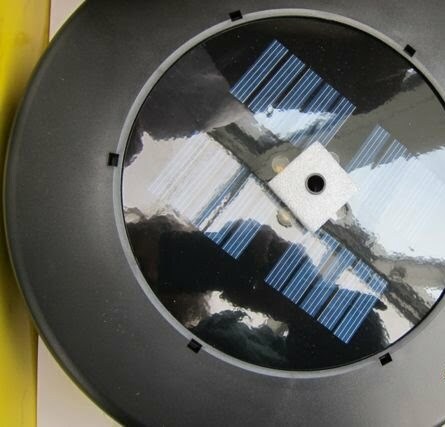 There are LED lights incorporated into the unit, so that it is illuminated at night, as you can see in the photo. It’s a shame I can’t see it from the house, as it would be lovely to look out of the window and see the fountain lit in this way. There’s only one real disadvantage of Low Voltage pumps and that is getting the cable in (which can be a problem if the surround is concreted/paved) but Low Voltage cables can be buried and hidden with ease (yourself, no electrician required) and are safe. 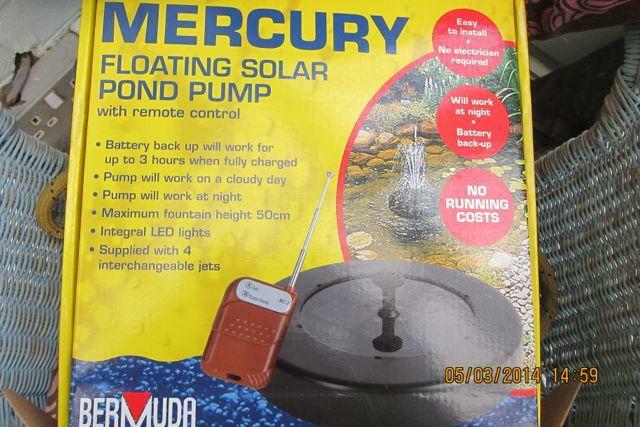 Lastly, if you’re using a solar pump to try to save electricity, these small pumps only use 15W which would cost you about $30 a year in Australia. Look forward to your comments and thoughts. Hi there, so far so good ! The english sun has been much more in evidence than it usually is at this time of year though, I do have to say! I have yet to evaluate its performance through a typical, gloomy summer ! Absolutely!!! Installing a solar-powered fountain in your outdoor garden transforms the place into a peaceful retreat. When it comes to attract birds, fountains are more suitable than still water. A soothing music with the fountain makes your garden a suitable place to spend some peaceful time. Recently, I purchased a fountain for my garden from Outdoor Living UK. It was the latest amongst all their collections. Some of my friends are also satisfied with their products.